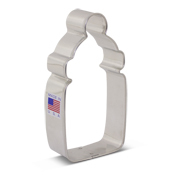 Everyone at the baby shower will "ooh" and "ahh" over the 4 1/4" Baby Onesie Cookie Cutter. 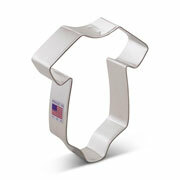 This very popular baby shape will capture the heart of the mom-to-be! 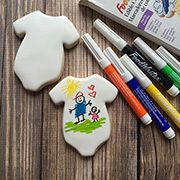 Not to mention how much fun onesie cookies are to decorate. In addition to cutting out adorable cookies, this shape could be attached to a gift, given as a shower favor or used for craft projects. Cookies decorated by Clough'D 9 Cookies. 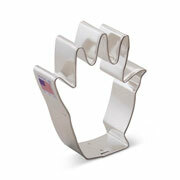 I always order my cookie cutters from you. You always have what I need & they ALWAYS arrive on time!! 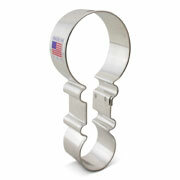 Love the size of this cookie cutter. 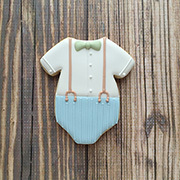 It makes for a great cookie to decorate, especially for events like a baby shower. I did pink and blue and they came out great and were a huge hit. I love this cutter shape. 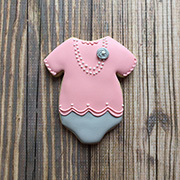 It's the perfect size for shower favors or gift baskets and can be re-shaped to make a t-shirt cookie! Arrived quickly and are as described. Love it - love them all! Products were shipped quickly and great quality! I had a graduation and birthday party to bake for and I found everything I needed right here. I will be buying from here now on. Dec 28, 2015 | By Elizabeth M.
This is exactly what I expected and needed.